Game update. Early access now for two new additions! Topic: Game update. Early access now for two new additions! They just announced the early access for Tank Crew and Flying Circus – Volume One. I want to get Tank Crew. Re: Game update. Early access now for two new additions! What I find fascinating is that all this stuff really merges together into one. You can really drive the KV-1 and the Tiger on Battle of Stalingrad missions if the mission designer offers that kite to you. And lo and behold, you can fight Fokker Dr.I vs. Spitfire Mk. IXe if you like. Isn't funny how that works? I buy BOS or whatever and the wife gets to spend it too. I'll have to wait for my next check to get Tank Crew but that will also give it time to work out any download and activation bugs. Now I only need to find time to adopt the new kites into our online training mission. And even more, I'm wondering what AI's taxiing performance will be with these planes, especially on the icy winter taxiways lol - "Ой, мороз мороз" - do I need to say more? If you get Tank Crew, could you add a mission or two on the server? One doesn't depend on the other, it all takes place in the same universe and the Mission Editor has it all, either way. The bigger problem is time. As you know, mine is pretty limited for the time being, so for the coming three months there won't be any new mission from my side. 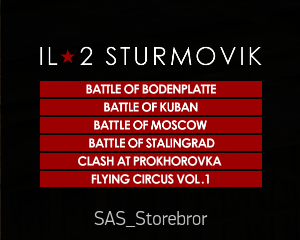 Just took a peek at the il2sturmovik.com store when Anne looked above my shoulder. Will be an expensive shopping saturday for me.